Seahawks Richard Sherman and Bobby Wagner expanded on their Twitter comments ripping Houston owner Bob McNair following Friday's practice. 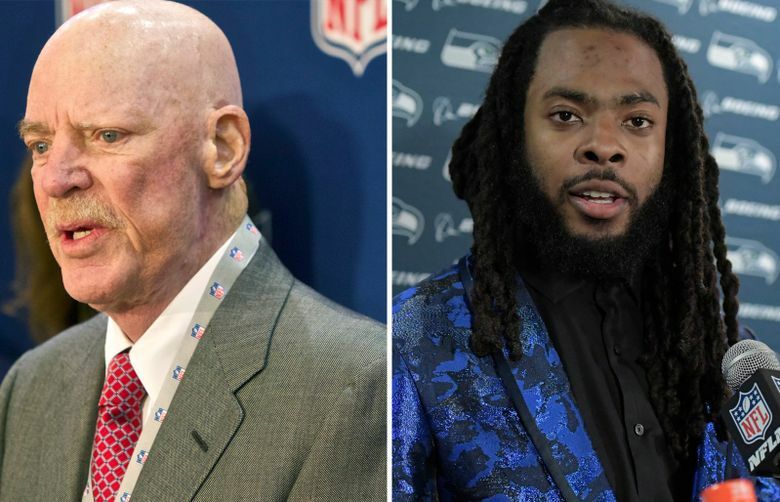 As disturbing as Richard Sherman feels the comment from Houston Texans owner Bob McNair revealed Friday really is, the Seahawks cornerback was also glad it was ultimately made public. The quote was part of a lengthy story detailing what occurred at the NFL league meetings last week as owners voiced concerns about player protests during the national anthem. ESPN reported that some Texans wanted to walk out of practice Friday before all but two — receiver DeAndre Hopkins and running back D’Onta Foreman — decided to go on with their usual workout. Adding an additional layer to the story from the Seahawks’ perspective is that Seattle hosts Houston on Sunday at 1:05 p.m. at CenturyLink Field. Both Sherman and Wagner noted the contrast in McNair, identified in the ESPN story as “a multimillion-dollar (Donald) Trump campaign contributor,’’ and Seattle owner Paul Allen. Sherman said “if he (McNair) was our owner I would feel strongly. But our owner is awesome. He feels like people should be treated equally and is all about civil rights and equality and he’s done his part as a philanthropist. So Thank God we don’t have to worry about our owner being involved in some that.’’ Allen was not at the league meeting detailed in the story. That echoed Sherman’s point, that McNair’s comment at least allows the players to know what they are dealing with. Houston left tackle Duane Brown was quoted after practice as saying the Texan players will “reconvene’’ to decide how to proceed. But Sherman said he didn’t anticipate a possible boycott by any players or any real change in Houston’s approach to the game. Wagner said he had some close friends on the Texans but didn’t want to reveal what any of them had said. Sherman is close with Hopkins, among others, but said he had not been in contact with him much this week since Seattle is playing Houston. Sherman said one reason he wouldn’t anticipate a boycott is the lack of guaranteed contracts in the NFL. Thirteen NFL players met with owners last week to talk about the concerns they have that have led to some players sitting or kneeling during the anthem (though no Seahawks were present). No specific agreements or changes in the policy regarding the anthem came out of that meeting and it is expected that a group of players will meet with owners and NFL commissioner Roger Goodell again next week, as well. Sherman said he did not think McNair’s comment should be viewed as a statement of how “higher-ups’’ in the NFL feel about players.